The Core Bluetooth framework makes many of the central-side transactions transparent to your app. That is, your app has control over, and is responsible for, implementing most aspects of the central role, such as device discovery and connectivity, and exploring and interacting with a remote peripheral’s data. This chapter provides guidelines and best practices for harnessing this level of control in a responsible way, especially when developing your app for an iOS device. When developing an app that interacts with Bluetooth low energy devices, remember that Bluetooth low energy communication shares your device’s radio to transmit signals over the air. Since other forms of wireless communication may need to use your device’s radio—for instance, Wi-Fi, classic Bluetooth, and even other apps using Bluetooth low energy—develop your app to minimize how much it uses the radio. Minimizing radio usage is especially important when developing an app for an iOS device, because radio usage has an adverse effect on an iOS device’s battery life. The following guidelines will help you be a good citizen of your device’s radio. As a result, your app will perform better and your device’s battery will last longer. When you call the scanForPeripheralsWithServices:options: method of the CBCentralManager class to discover remote peripheral’s that are advertising services, your central device uses its radio to listen for advertising devices until you explicitly tell it to stop. Unless you need to discover more devices, stop scanning for other devices after you have found one you want to connect to. Use the stopScan method of the CBCentralManager class to stop scanning for other devices, as shown in Connecting to a Peripheral Device After You’ve Discovered It. Remote peripheral devices may send out multiple advertising packets per second to announce their presence to listening centrals. When you are scanning for devices using the scanForPeripheralsWithServices:options: method, the default behavior of the method is to coalesce multiple discoveries of an advertising peripheral into a single discovery event—that is, the central manager calls the centralManager:didDiscoverPeripheral:advertisementData:RSSI: method of its delegate object for each new peripheral it discovers, regardless of how many advertising packets it receives. The central manager also calls this delegate method when the advertisement data of an already-discovered peripheral changes. If you want to change the default behavior, you can specify the CBCentralManagerScanOptionAllowDuplicatesKey constant as a scan option when calling the scanForPeripheralsWithServices:options: method. When you do, a discovery event is generated each time the central receives an advertising packet from the peripheral. Turning off the default behavior can be useful for certain use cases, such as initiating a connection to a peripheral based on the peripheral’s proximity (using the peripheral received signal strength indicator (RSSI) value). That said, keep in mind that specifying this scan option may have an adverse effect on battery life and app performance. Therefore, specify this scan option only when it is necessary to fulfill a particular use case. A peripheral device may have many more services and characteristics than you may be interested in when you are developing an app to fulfill a specific use case. Discovering all of a peripheral’s services and associated characteristics can negatively affect battery life and your app’s performance. Therefore, you should look for and discover only the services and associated characteristics your app needs. After you have discovered the two services you are interested in, you can similarly look for and discover only the characteristics of these services that you are interested in. Again, simply pass in an array of the UUIDs that identify the characteristics you want to discover (for each service) to the discoverCharacteristics:forService: method of the CBPeripheral class. You can explicitly poll for a characteristic’s value by calling the readValueForCharacteristic: method each time you need the value. You can subscribe to the characteristic’s value by calling the setNotifyValue:forCharacteristic: method once to receive a notification from the peripheral when the value changes. It is best practice to subscribe to a characteristic’s value when possible, especially for characteristic values that change often. For an example of how to subscribe to a characteristic’s value, see Subscribing to a Characteristic’s Value. You have all of the data you need from the peripheral device. Note: The cancelPeripheralConnection: method is nonblocking, and any CBPeripheral class commands that are still pending to the peripheral you’re trying to disconnect may or may not finish executing. Because other apps may still have a connection to the peripheral, canceling a local connection does not guarantee that the underlying physical link is immediately disconnected. From your app’s perspective, however, the peripheral is considered disconnected, and the central manager object calls the centralManager:didDisconnectPeripheral:error: method of its delegate object. Retrieve a list of known peripherals—peripherals that you’ve discovered or connected to in the past—using the retrievePeripheralsWithIdentifiers: method. If the peripheral you’re looking for is in the list, try to connect to it. This reconnection option is described in Retrieving a List of Known Peripherals. 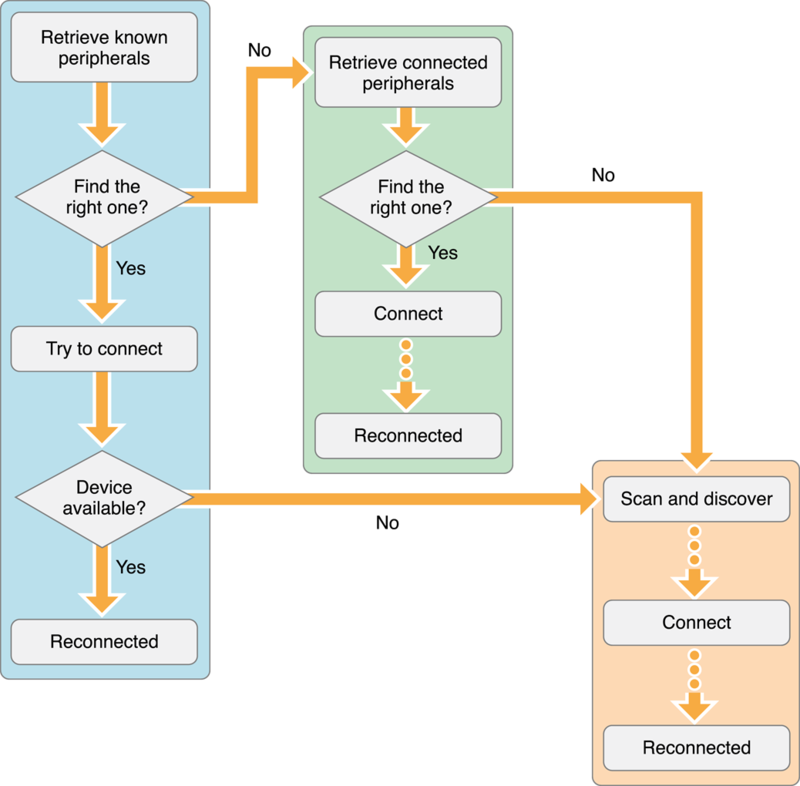 Retrieve a list of peripheral devices that are currently connected to the system using the retrieveConnectedPeripheralsWithServices: method. If the peripheral you’re looking for is in the list, connect it locally to your app. This reconnection option is described in Retrieving a List of Connected Peripherals. Scan for and discover a peripheral using the scanForPeripheralsWithServices:options: method. If you find it, connect to it. These steps are described in Discovering Peripheral Devices That Are Advertising and Connecting to a Peripheral Device After You’ve Discovered It. Depending on the use case, you may not want to have to scan for and discover the same peripheral every time you want to reconnect to it. Instead, you may want to try to reconnect using the other options first. As Figure 5-1 shows, one possible reconnection workflow may be to try each of these options in the order in which they’re listed above. Note: The number of reconnection options you decide to try, and the order in which you do so, may vary by the use case your app is trying to fulfill. For example, you may decide not to use the first connection option at all, or you may decide to try the first two options in parallel. The first time you discover a peripheral, the system generates an identifier (a UUID, represented by an NSUUID object) to identify the peripheral. You can then store this identifier (using, for instance, the resources of the NSUserDefaults class), and later use it to try to reconnect to the peripheral using the retrievePeripheralsWithIdentifiers: method of the CBCentralManager class. The following describes one way to use this method to reconnect to a peripheral you’ve previously connected to. The central manager tries to match the identifiers you provided to the identifiers of previously discovered peripherals and returns the results as an array of CBPeripheral objects. If no matches are found, the array is empty and you should try one of the other two reconnection options. If the array is not empty, let the user select (in the UI) which peripheral to try to reconnect to. When the user selects a peripheral, try to connect to it by calling the connectPeripheral:options: method of the CBCentralManager class. If the peripheral device is still available to be connected to, the central manager calls the centralManager:didConnectPeripheral: method of its delegate object and the peripheral device is successfully reconnected. Note: A peripheral device may not be available to be connected to for a few reasons. For instance, the device may not be in the vicinity of the central. In addition, some Bluetooth low energy devices use a random device address that changes periodically. Therefore, even if the device is nearby, the address of the device may have changed since the last time it was discovered by the system, in which case the CBPeripheral object you are trying to connect to doesn’t correspond to the actual peripheral device. If you cannot reconnect to the peripheral because its address has changed, you must rediscover it using the scanForPeripheralsWithServices:options: method. For more information about random device addresses, see the Bluetooth 4.0 specification, Volume 3, Part C, Section 10.8 and Bluetooth Accessory Design Guidelines for Apple Products. Another way to reconnect to a peripheral is by checking to see whether the peripheral you’re looking for is already connected to the system (for instance, by another app). You can do so by calling the retrieveConnectedPeripheralsWithServices: method of the CBCentralManager class, which returns an array of CBPeripheral objects representing peripheral devices that are currently connected to the system. Because there may be more than one peripheral currently connected to the system, you can pass in an array of CBUUID objects (these object represent service UUIDs) to retrieve only peripherals that are currently connected to the system and contain any services that are identified by the UUIDs you specified. If there are no peripheral devices currently connected to the system, the array is empty and you should try one of the other two reconnection options. If the array is not empty, let the user select (in the UI) which one to try to reconnect to. Assuming that the user finds and selects the desired peripheral, connect it locally to your app by calling the connectPeripheral:options: method of the CBCentralManager class. (Even though the device is already connected to the system, you must still connect it locally to your app to begin exploring and interacting with it.) When the local connection is established, the central manager calls the centralManager:didConnectPeripheral: method of its delegate object, and the peripheral device is successfully reconnected.